The Salone del Mobile, which took place last week in Milan, wasn't the only place where new pieces from the world of home and interior design were presented. The Design Week's Fuorisalone allowed selected brands to show their new collections - as well as new pieces and prototypes - outside of the main exhibition. Each Fuorisalone exhibition had a unique feel, whether charming in a specially rented old building, such as Marimekko, nostalgic like Casa Vitra, which was furnished in the former office of architect and designer Antonio Citterio, or imposing, like the Danish brand Hay's presentation, which converted La Pelota - a large event hall spanning 2000 square metres- for the Fuorisalone. As well as the culinary delight of genuine Danish delicacies and the Minimarket shop, Via Palermo featured ten different sections, each with its own theme, where the latest Hay highlights could be marvelled at. The entrance area and courtyard were decked with the newest design products by Ronan and Erwan Bourouellec. Benches, sofa and chairs from the Palissade Collection seemed to invite guests to pause and relax. With the Palissade Collection, the design brothers Ronan and Erwan Bouroullec have created a collection of outdoor furniture that perfectly combines function and beauty. Made of powder-coated steel, the furniture is sturdy but at the same time exciting because of its graphically-filigree design that fits effortlessly into the café, garden, terrace or balcony. The Palissade garden furniture was not the only new collection from the Bouroullec brothers. 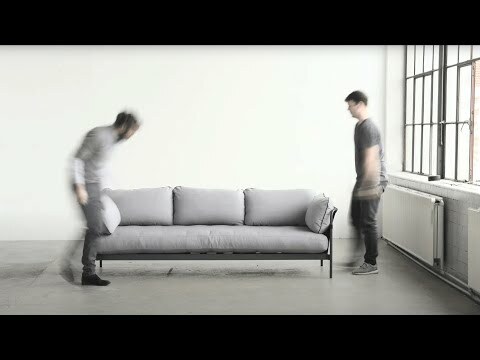 The Can Sofa Collection, which was also presented for the first time at the Milan Design Week, is also by the French design team. The feature that makes the Can Collection stand out is that it is delivered as a flat-pack. That means it's not just practical for delivery but also for the next big house move, when the sofas and armchairs can be quickly and easily taken apart and driven to the new place. The name of the collection comes from the idea of "you CAN make it". The goal was to question the stereotype of the sofa as a cumbersome and heavy piece of furniture. The result of the design process is a furniture collection that is "simple, relaxed and for everyone", with easy self-assembly. It has taken three years for the collection to grow from the idea to the sketches all the way through to prototypes and the finished product. The sofas and armchairs are now available with the frames and upholstery able to be individually personalised to the customer thanks to the various colours and varnishing options. As if Ronan and Erwan Bouroullec haven't had enough on their plates over the last few years with the design of the Can and Palissade Collections, the Copenhague Collection has also seen some new additions. Under the name Copenhague Deux, Hay presented dining tables, coffee tables and bistro tables as well as a bench, which all complement the distinctive design of the Copenhague series. The new tables feature a new, even sturdier nano-surface and a wider frame, providing even more leg space and room for several chairs. Other designers have been busy, too. The New Order Collection by German designer Stefan Diez has expanded by various tables and storage solutions for the office and kitchen. The modular storage system was presented in an imposing and impressive manner: stacked metres high and furnished with multiple drawers, mirrors and doors: guests were presented with countless combinations for the shelves, which will be available in the summer. As well as countless new pieces, there were a few old faces. Hay presented the famed About a Chair in a total of twelve new colours. From a rich red or green through to powdery pastel colours, the chair will be available with seats and legs in various trend colours. Guests were excited by the AAC with contrasting seat and leg colours as well as with a more natural frame. The Loop Series has also been updated. The clothes rack and frames by Leif Jørgensen are now available in a soft grey tone as well as the original black and white. With the expansion of the collection, the design of the Loop bed, which was already on the market a few years ago, has been brought back to life with an improved shape. With a new push-fit system and in the usual Scandinavian design, the bed will be available to order soon and in various sizes. Introducing Wrong London. The sub-brand - named for the leading designer Sebastian Wrong - had been running up until recently under the Label Wrong for Hay and carried accessories, textiles, lamps and small furniture. With a new focus, Wrong.London is now exclusively responsible for the design of lights for Hay. The goal is to develop an assorted range that unites aesthetic, technical and humorous design. Fitting the occasion, the Vlisco shades were also introduced in La Pelota. Table and standing lamps with colourful patterns, made in collaboration with the Danish brand of the same name - Vlisco. The company has been producing textiles and waxes with African patterns for 170 years. More new products in the lamp area included the 30degrees pendant lamp with a wood-veneer shade by designer Johan van Hegel as well as a PC desk lamp by Duncan Riches. Another highlight in La Pelota was the Soft Edge chair by Iskos-Berlin. Although its appearance may at first glance seem plain, the design is so innovative that it required the invention of new production techniques. There had already been experiments with possibilities for the standard veneer back in the 50s, but they quickly hit a wall. Boris Berlin and Aleksej Iskos have taken on the torch - together with Hay. The result is the Soft Edge chair. A significantly lighter, stackable (even with its wooden frame) chair that uses reduced resources. The soft form seat and back rest allow a "dynamic seating comfort". Movement - that was the main takeaway from the Hay presentation at the Salone del Mobile. There was hardly another brand in Milan that was as impressive, with such a multitude and variety of new products, as Hay.. Presenting furniture and collections by Stefan Diez, Ronan and Erwan Bouroullec as well as other designs such as the Dapper and Uchiwa armchair by Dosho Levien and the 13Eighty chair by Scholten & Baijings, each highlight was better than the last. Productive and innovative in 2000 square metres, Hay presented designs that unite high quality and contemporary design - at affordable prices.